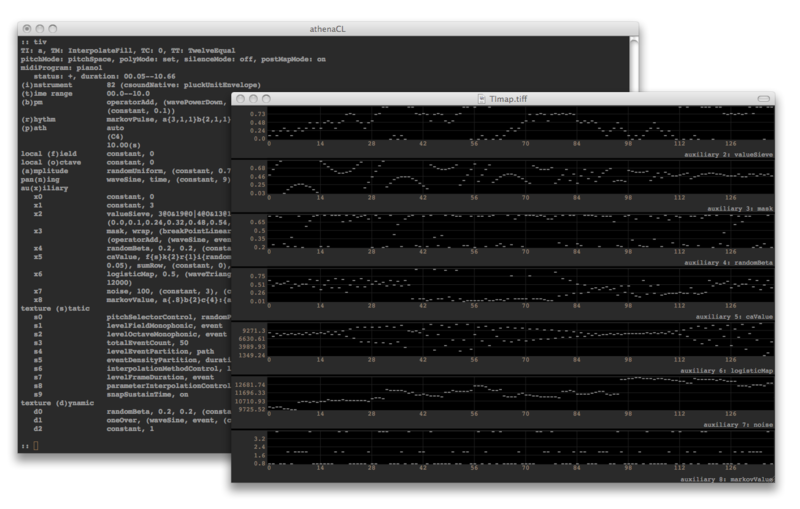 modular poly-paradigm algorithmic music composition in a cross-platform interactive command-line environment. The athenaCL system is an open-source, object-oriented composition tool written in Python. The system can be scripted and embedded, and includes integrated instrument libraries, post-tonal and microtonal pitch modeling tools, multiple-format graphical outputs, and musical output in Csound, SuperCollider, Pure Data, MIDI, audio file, XML, and text formats. Musical parts are deployed as Textures, layered surface-defining objects containing numerous independent ParameterObjects to control pitch, tempo, rhythm, amplitude, panning, and instrument (Csound) parameters. The system includes an integrated library of Csound and SuperCollider instruments, and supports output for external Csound instruments, MIDI, and a variety of alternative formats. Over eighty specialized Generator, Rhythm, and Filter ParameterObjects provide tools for stochastic, chaotic, cellular automata based, Markov based, generative grammar and Lindenmayer system (L-system), wave-form, fractional noise (1/f), genetic, Xenakis sieve, linear and exponential break-point segments, masks, and various other algorithmic models. ParameterObjects can be embedded in other ParameterObjects to provide powerful dynamic and masked value generation. 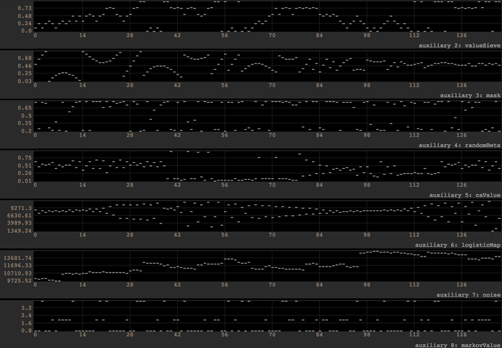 Textures can be combined and edited, and tuned with algorithmic Temperament objects. Texture Clones allow the filtering and processing of Texture events, performing transformations not possible with parameter generation alone. The algorithmic system uses Path objects to organize and share pitch groups. Paths provide simultaneous representations of ordered content groups in set-class, pitch-class space, and pitch space. athenaCL 2. Python 2.6 is required for running athenaCL. The Tutorial Manual provides complete documentation for athenaCL 1, and includes tutorials, reference materials, graphical examples, frequently asked questions, and installation instructions. Documentation for athenaCL 2 is forthcoming. athenaCL development is conducted at Google Code; anonymous SVN access to the code repository is available.